From the award-winning author of No One Is Here Except All of Us, an imaginative novel about a wealthy New England family in the 1960s and '70s that suddenly loses its fortune—and its bearings.Labor Day, 1976, Martha's Vineyard. 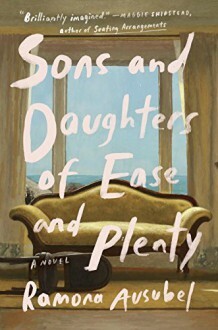 Summering at the family beach house along this moneyed coast of New England, Fern and Edgar—married with three children—are happily preparing for a family birthday celebration when they learn that the unimaginable has occurred: There is no more money. More specifically, there's no more money in the estate of Fern's recently deceased parents, which, as the sole source of Fern and Edgar's income, had allowed them to live this beautiful, comfortable life despite their professed anti-money ideals. Quickly, the once-charmed family unravels. In distress and confusion, Fern and Edgar are each tempted away on separate adventures: she on a road trip with a stranger, he on an ill-advised sailing voyage with another woman. The three children are left for days with no guardian whatsoever, in an improvised Neverland helmed by the tender, witty, and resourceful Cricket, age nine.Brimming with humanity and wisdom, humor and bite, and imbued with both the whimsical and the profound, Sons and Daughters of Ease and Plenty is a story of American wealth, class, family, and mobility, approached by award-winner Ramona Ausubel with a breadth of imagination and understanding that is fresh, surprising, and exciting.